More recently, 800-series SLRs Nikon replenished third model – Nikon D810, which eventually may displace Nikon D800, but in the near future D800 will not leave the active line Nikon, will be sold in parallel with the D810. Especially with the advent of the new model price falls a little old. Increase the light sensitivity range: Lower – up to ISO 64 in normal mode and up to ISO 32 in the extended top – to 12,800 in normal mode and up to 51200 in the extended. 60 full-frame progressive scan when shooting video in Full HD – 1920 × 1080 60p. Empowerment of the screen. Not at the expense of resolution in pixels, it has remained the same – 640 × 480, but each pixel received additional white point (subpixel). Thus, the total number of dots (subpixels) rose to 1,228,800, and the RGB color model has evolved into RGBW. It’s pretty interesting solution that allows you to increase the screen brightness without increasing power consumption. Matrix remains the same size and resolution (36.3 effective megapixels), but it differs from the matrix D800 and D800E. Most likely due to non-traditional (non-Bayer) distribution of filters in the model D810 managed to get rid of the optical low-pass filter. Fashionable topic today, but I think it’s not just fashion – after all of the circuit is removed one link, and moire are suppressed, not worse. D810 shutter has also been updated, it used an electronic first curtain. This reduces mikrosotryasenie camera when you open the shutter. And makes the overall noise “click” a little less audible. Finally, another difference – in the Nikon D810 used “trick” from Nikon 4Ds, the so-called group AF area (Group Area AF). This is an opportunity to join in the focus area to five points, the ability to accurately track the movement of an object within a zone. Autofocus is not necessary to “prowl” across the frame, you can concentrate within the zone. In systems theory there are three stages of life of the system. Slow start – formation. Next – a dramatic development. Next – the gradual saturation of the transition to the stage of slow development. Design SLR – a typical example of the saturation stage, when to change anything substantial and difficult, and not too smart. Some details of the design D800 in the 810th model changed, but they are not as important to examine them in detail. switch Auto / Manual Focus. Beside «D810» under the rubber plug – terminal sync flash system. Quite often, a high-end SLR models are not supplied with built-in flash. In this sense, the Nikon D810 – a pleasant exception. Very often, even in the open, in good light, light illumination is required. Producer states: “Durable Magnesium alloy body: reliable sealing protects camera D810 from water and dust.” But, unfortunately, does not indicate the degree of dust and moisture protection. As you can see, the flash is emitted very high – more than 5 inches from the edge of the lens. Around the shutter button three-position switch: Off – On – Highlight control LCD panel. Button on the left of the lens: Pv (preview repeater diaphragm) and Fn – programmable function. A model 810 (as many professional DSLRs), two memory card slots – Format CF and format SD. It is clear that the two cards can be used in different modes: separate and duplicative. From this angle is clearly visible mechanism diopter adjustment viewfinder. It works on the principle of “move the arrow in hours” – it is necessary to delay the head mechanism, only then you can make a correction. Rear panel – no “surprises”. And it’s good! The buttons of course, not exotic. Next to the viewfinder eyepiece seen the locking lever. It is used infrequently – when installing additional lenses to expand the diopter adjustment. On the drive select “broach” we see: S – single-frame shooting, CL and CH – continuous low and high speed. Q – quiet shutter. QC – quiet continuous shooting. Self-timer icon. And last – MUP, raised mirror mode, which is used to clean mikrosotryaseniya camera, for example, in the macro. Here we see a slight difference from the design of Nikon D800 – before the three flaps have been combined into one. And now – disconnected. Below the upper hidden mini-jack 3.5 mm -audiovyhod and mic. Average cover protects the connector USB 3.0. This connector can be connected not only to the computer, but also additional communication devices and control via LAN or Wi-Fi. Lower slot – Mini-HDMI. In tinctures camera can set the image format for the TV. Disc shooting modes as such is absent. One of the PASM mode is selected using the Mode button and control dial. On the mode “pulling” on the left are buttons to set the white balance, metering type, ISO and shooting format (JPG, TIF, RAW, RAW + JPG). Button on top of the disc, “drawing” – blocker. To select the “pulling” or raise the mirror, you should press the lock. There is nothing unusual – capacity battery, a charge which CIPA standard should be enough for 1,200 frames. Next to the battery compartment cover, below, under the rubber plug is a connector for an optional battery pack MB-D12. From what has not been mentioned: the back panel has the lever L. It locks the focus switch to accidental contact with AF knocked position. But in general, if we understand that the control circuit is built on two control wheels, instead of the classical mode dial on the left of the lens is dial “pulling” and PASM modes are selected using the Mode button and control dial – if all is to understand the work the camera becomes easy and convenient. This externally without using the menu. Let’s see what we meet, if we begin to use the advanced settings. I am afraid that it will be easier to get confused here. Not because the menu poorly organized, but because the number of settings and screens large. When preparing this material, I shot a 118 menu screens, and for the 36 selected articles deal! The canvas of the nine rows of four slide better split into two blocks. So, what we have before the test? The camera weighs almost a kilogram. Designers managed to make 810-th model 20 grams lighter than the Nikon D800. The body and the control circuit do not differ from what was its predecessor, but minor elements yet changed. In my opinion, for the better. Internal changes are more significant: it is the absence of low-pass filter, redesigned the shutter mechanism, electronic front curtain, an extended range of ISO, increased the burst speed, the ability to create a group of AF points (this increases the probability of tracking the main subject and not the background or foreign objects in the picture) . And another little remark. Lamps shine in our laboratory with a temperature of 3500 Kelvin. If you set the white balance on a scale of temperature or to “incandescent lamp”, the white balance is not a problem. A slight shift of balance is usually present when you put it on the machine. And sometimes quite significant shift – when setting manually white, although it would seem, is a simple procedure, and white and gray target in our laboratory have in abundance. So now once again we apologize for not having brought balance to the mind, and continue to abandon this procedure, will exhibit 3500 K or “incandescent lamps.” As a test, procedure manual setting of white is of little value, you can lose a lot of time, but in the laboratory every hour counts. When RAW film development at this time we are forced to put the temperature of 3500 instead of 5500, as determined by Nikon D810 18-percent gray sheet. From the top of sensitivity – ISO 51200 – is breathtaking, although, of course, shoot at this level can only ISO aliens, that they may believe that you met with them (and still do not believe it because of the noise). And the signs of normal pictures disappear somewhere on the level of ISO 6400 – 8000 (where everyone chooses for themselves). Pleased to note that the average level of squelch works very delicately, even at the highest sensitivity can parse the individual digits. However, let’s see what will show radial worlds, allowing to define the resolution in lines per pixel. Test pictures were taken with the lens Nikon 85mm f / 1.8G AF-S Nikkor. At the minimum ISO sensitivity 64 in RAW, we observe a very high resolution – 0.9 lines per pixel. As far as I remember – it’s a record, such a high resolution still has not shown any camera that visited our laboratory over the past year and a half. At the same time without shumodava JPG and minimum sensitivity to shumodava give a result in the region of 0.74 lines per pixel. Also very high resolution, but the algorithms intracameral JPG eat 0.15 lines per pixel. That’s a lot! Perhaps there are reasons, but they are not easy to understand. And then, as seen in the graphs, the resolution is very slow decline with sensitivity up to ISO 3200 (we assume its working), then – continued to decline to 0.4-0.5 irregular lines per pixel on the sensitivity of ISO 25600. But as we have said, with high sensitivity (for the Nikon D810 is ISO 12800 and above) quantitative analysis is meaningless. Become too strong color and luminance artifacts to the picture quality could be tied to the resolution. Nikon 85mm f / 1.8G AF-S Nikkor can not be called cheap or inexpensive. Its luminosity is impressive, and in addition, impressive geometric distortions. Rather, their almost complete absence. Vertical distortion is very small – D = 0,25, horizontal distortion even less – D = 0,03. Let’s see what the resolution and level of “chromatic” provides this lens. Typically, the resolution is not too high at the edges – with open and closed aperture. And is relatively large at medium apertures. In the case of Nikon 85mm f / 1.8G AF-S Nikkor it changes randomly, but in a very small range and remains very high – an average of 0.8 lines per pixel in the center of the frame and just below the edge. As for chromatic aberrations, they are very reasonable. In the center of the frame, our program has recorded something commensurate with the measurement error. At the edges of the level of “chromatic” is around 3% – this is a decent result. A drop in brightness is only noticeable at wide apertures, then it appears to be negligible. Now we can expand the pros and cons portretnik Nikon 85mm f / 1.8G AF-S Nikkor. Very high resolution across the frame, both in the center and the periphery. Almost perfect geometry of the frame, the distortion is close to zero. Almost complete absence of chromatic aberration in the center of the frame and a very low level on the edge of them. High speed and accuracy of focus. Nikon 85mm f / 1.8G is not equipped with a stabilizer. For portretnik it is quite large and heavy. And the price he has rather big. But taking into account the disadvantages also need to bear in mind that Nikon 85mm f / 1.8G AF-S Nikkor – professional lens with characteristics worthy of the highest praise. Small picture in the table does not convey the appearance of the lens. It is advisable to click the big picture by press F to display the full size image, and then a few more times “control plus” to the lens does not fit into the screen. That’s when it will look similar to the real one. Nikon 70-200mm f / 2.8G is huge in size and weight, all rather big Nikon D810 paired with it seems an advanced compact. On the other hand, when you walk down the street with this lens, people respect. Size, of course, sometimes matters, but let’s see how well the characteristics of this monster. On the short “focus” (ranged from 70 mm lens – this is a short “focus”) distortion weakly expressed. Total D = -0,57 vertically and D = -0,28 horizontally. This is a very fair price “barrel” distortion at the edge of the screen will be almost unnoticeable. Part-resolution Nikon 70-200mm f / 2.8G ED AF-S VR II Zoom-Nikkor behaves predictably – a relatively low resolution for the wide and narrow difragme, relatively high on average. Typically, the resolution at the edge of the frame is lower than in the center. But in this case in the range of f / 2,8 – f / 18 at the center of the frame, it remains high and very high, greater than 0.7 lines per pixel. At the narrowest aperture of f / 22 is lowered to 0.6 (which is also very, very bad). On the edge of the frame resolution varies between 0.6 and 0.75 lines per pixel, the greatest failure falls on the widest aperture and a narrow resolution even at the edge is larger than in the center. The level of “chromatic” in the center of the frame is very small, but on the edge goes to the level of 5%. In principle, it is a little, but if you remember how much the hero of the novel, it seems that is not so little. The more so because, as we shall see, on average, “focus” chromatic aberration are almost invisible. Furthermore, at the widest aperture f / 2,8 (and only on it), we see the edge of the frame and a significant defocusing noticeable decrease in brightness. Not much how it all scary (edge of the frame is not as important as the center), but it is better to know about it. On average, the focal length of 120 mm (nice that it is not necessary to recalculate anything) vertical distortion becomes more noticeable – D = 1,46. Not the biggest “cushion” in the world, but it is visible to the naked eye. In this case, the horizontal “pillow” remains very moderate – D = 0,44. Resolution in the center of the frame in the range f / 3,5 – f / 16 is kept at a level above 0.7 lines per pixel, at f / 10 comes up to a maximum of 0.88 lines. At the wide and narrow aperture permission sags slightly but does not fall below 0.63 lines per pixel. On the edge of the frame only at the widest aperture resolution falls below 0.5 lines per pixel. Rather, it is due not to a resolution as such, but with the defocus on the edge of the frame, which is observed on the widest aperture f / 2,8. Perhaps this Defocus suffers only one copy of Nikon 70-200mm f / 2.8G ED AF-S VR II Zoom-Nikkor, that he had been in our lab, but we have tested that received from the manufacturer. And fixed it. But on average, “focus” almost completely disappear chromatic aberration. Even at the edge of the frame they barely visible, just lifted above the zero level on the aperture – a maximum of 3%. And finally, on a long “focus” 200 mm (count, again, nothing else) vertical distortion becomes even more pronounced – D = 1,63. Also not the biggest “cushion” in the world, but it can also be seen with the naked eye. And horizontal “pillow” to the maximum “focus” grew up to D = 1,14. Resolution on the long “focus” remains very high – in the wide and narrow aperture of 0.6 lines per pixel, on average – about 0.75. Chromatic aberrations in the center of the frame are practically absent, but edges of the frame grow to approximately 5%. Nikon 70-200mm f / 2.8G. Stabilizer. Methods of testing the stabilizer (efficiency estimates) was described in detail in a previous article. It is, in general, already well established and rarely changes, but in the case of Nikon 70-200mm f / 2.8G, we had to slightly change the conditions and shoot at a focal length of 70 mm instead of the usual 50 However, this does not contradict the procedure, only slightly changes the input conditions. And again, just in case we started to shoot at shutter speeds 1/30 second. As can be seen on the schedule, our statistical model indicates that the probability of obtaining a clear picture of 0.7 accounted for 5.1 seconds shutter speed. If you increase the fifth and a third of a four-stage EV, we get about 1/70 of a second – the shutter speed, which dictates epmiricheskoe rule of “the reciprocal of the focal length is approximately equal to the shutter speed needed to obtain a clear picture.” That is, the effectiveness of our method is approximately equal to the stabilizer 4 and third stages. Manufacturer assesses performance in the range of 3.5-4.5 degrees, which means that our estimates do not contradict each other. Nikon 70-200mm f / 2.8G. Totals. High, constant aperture throughout the range of the DF. High and very high optical resolution in the center of the frame, and on the edge. Moderate level of chromatic aberration. Very high efficiency of the stabilizer. Very high price, size, weight. A slight defocusing, which is observed only at the widest aperture, just on the edge of the frame. Slight darkening at the edge of the frame, which is clearly visible only at the widest aperture. On the quality of shooting again met different opinions. “Much difference, Nikon D800 or D810, no” – so say the photographers who shoot slow-moving objects without speed reportage. But here, perhaps, the most valuable opinion of the person who is engaged in a very tight wedding and corporate shooting (the same report, but with increased responsibility). The speed and accuracy of autofocus is difficult to distinguish from the D810 D800. But the group autofocus at D810, of course, a very useful tool. 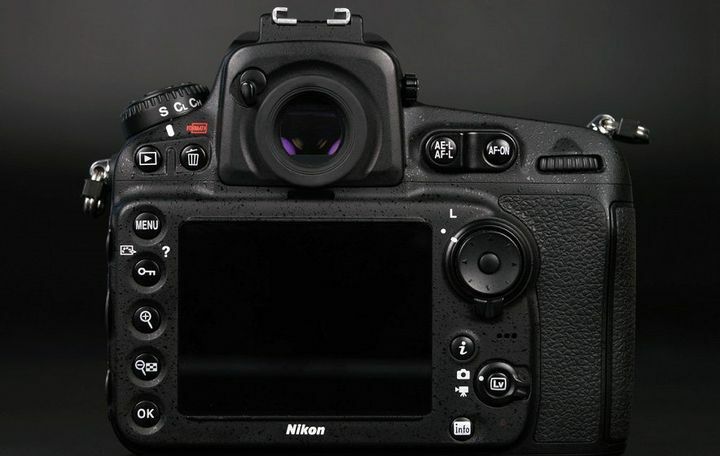 The most important thing that we did in the Nikon D810 – redesigned shutter. Nikon D800 «smeared itself,” ie. E. Picked up at the mirror and shutter happened mikrosotryasenie camera, enough to notice it at 36 megapixels. Very rapid movement of the camera, the pixel size is small, so that SmAZ was evident even at short exposures. At Nikon D810 does not. Quiet mode is even quieter. This is important if the shot does not allow the loud “click” – for example, in the church. A very useful thing. Go ahead to the burst speed. Let’s start with a low-speed shooting mode with the installation of 3 frames per second (Nikon D810 allows you to adjust the speed of the low-speed continuous shooting). The number of frames in the series can also be adjusted – the maximum value of 100 After hundreds of frames the camera pauses, but rather again press the shutter button, it otschelkaet next hundred at the same rate as the first. Here we see a decrease in speed in the second hundred frames when shooting in JPG. But in general, the measurements correspond to the manufacturer, “shooting at 5 frames per second.” We consider that we always make measurements at the highest quality JPG. And in the case of Nikon D810 – the highest quality RAW: You can reduce the number of bits to 12 RAW files will be smaller and the shutter speed will increase. But these measurements happy owners of Nikon D810 already produce themselves. Next, we have high-speed shooting. Somewhat unexpected result: When shooting JPG speed continuous shooting was a tad slower than the slow burst with the installation of 6 fps. And when shooting RAW and RAW + JPG – the same to the nearest hundredth. It turns out that these two modes overlap with each other. Or speed continuous shooting is only needed when the regular set to a lower speed. Perhaps at low speed we get a win (on the accuracy of focusing, for example), but this is the subject of a separate study. Yes, sometimes you wonder when you see the results. Imitating Georg Cantor (creator of set theory), I want someone to write (he wrote Julius Dedekind): “I see, but do not believe it!” It’s funny! It’s funny that mode RAW + JPG in rapid phase may be faster than the mode of RAW. However, then (in the slow phase) RAW still wins back his. If you’ve been paying attention to the timetable “Stabilizer Nikon 70-200mm f / 2.8G» – it turned out the initial curve sloping. “Aim” even without a tripod at a minimum distance of 70 mm is very difficult, hard and long “spyglass” just jumps (that did not stop her at exposures up to 5.1 seconds to give most of the frame with a fine sharpness). And for video shooting without a tripod Nikon 70-200mm f / 2.8G – not exactly the best lens. Even in broad daylight, even with the stabilizer on. Is that in your artistic plans include accented shooting “with hands”. Our plan is not included, but the other zoom lens but Nikon 70-200mm f / 2.8G, we have at the time of testing was not. In any case, in the “Digital photo” we only try video, but do not do a full test. In general, Nikon D810 positions as the camera that can be used for professional video shooting. Most likely, it’s true. But this professional photography camera should be clothed in “keno”, it looks like a battle D810 elephant in the garb War Mammoth. And if a little more seriously – yes, we shot a video in very windy conditions (wind noise scores all sounds). This video shows how smooth and well-D810 draws frame. The quality of exposure, sharpness, no hint of falling frames. Even when there is a rapid movement from one object to another, the picture is smooth, not twitching (honest 60 fps). That’s all that can show our “test”. For the present study as D810 camcorder takes time, additional equipment, a set of lenses and, most importantly, hands and head, able to shoot professionally. Otherwise (without hands, head and equipment) D810 remain home video camera. It seems that all the available information about the Nikon D810 is collected, it is possible to summarize. Without a doubt, Nikon D810 – the high-end camera. With good optics, it provides amazing photos: color, plastic, precision, dynamic range. In comparison with the Nikon D800 and Nikon D800E even done a lot of “work on the bugs.” First of all, is a re-valve and the problem mikrosotryaseny 36-megapixel matrix. The second important point – the appearance of AF group. Burst rate is high enough for a dynamic sequential shooting. For a sports report is likely to speed 5 fps is not enough. However, this is difficult to provide a definitive diagnosis – someone who likes to “shoot” series, some prefer to predict the exact footage. A marked increase in price compared to Nikon D800 and D800E. The lack of built-in modules Wi-Fi and GPS. Perhaps, after all comparisons, we can conclude that the Nikon D810 has reached a new level of quality compared to the D800 and D800E. Probably the same conclusion came and manufacturer, announced a price of 20-25 per cent higher than that of their predecessors. But the pattern develops: higher possibilities – the higher the price. For professional quality always has to pay a lot of money.